SAN JOSÉ, CA – On December 8th inside the Center for the Performing Arts one could feel the electricity emanating from the audience: children and adults dressed in glamorous gowns, work clothes, covered with sweaters or fur coats. 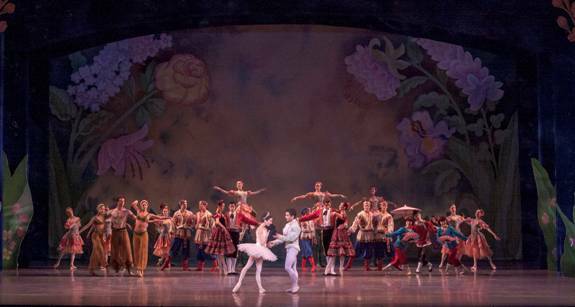 The occasion was the World’s premiere of Tchaikovsky’s new version of THE NUTCRACKER of Ballet San José. 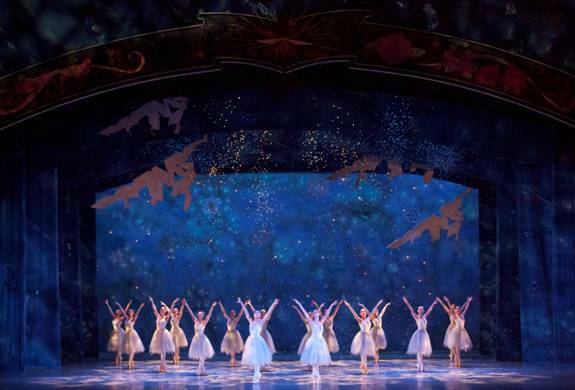 The previous production of THE NUTCRACKER, choreographed by former B.S.J. Artistic Director Dennis Nahat, had been recognized for years as the best of all THE NUTCRAKER ballets. On this night, however, B.S.J. was premiering a new version written and choreographed by one of its Principal Dancers, KAREN GABAY. Stories about nutcrackers appeared in the folk-tales of Bohemia and Poland many years ago, but the story that Alexandre Dumas (father) adapted for the NUTCRACKER ballet of Pyotr Ilyich Tchaikovsky choreographed by MARIUS PETIPA and LEV IVANOV, may be traced with accuracy to Germany and to the great story teller ERNST THEODOR AMADEUS HOFFMANN who wrote it in l8l6 with the title “Nusskraker und Mausekönig (Nutcracker and Mouse King) for a volume of children’s stories. In HOFFMANN’s story this is how a man was turned into a nutcracker: when Marie Stahlbaum lies recovering from the fright of the mice’s battle with the tin soldiers in the living room of her house, Herr Drosselmeyer, (Mr. Drosselmeyer) her godfather, a builder of clocks and mechanical toys, tells her the story about the beautiful princess Pirlipat, a baby whose life is threatened by the wicked Lady Mouseykins. The only person who could save the baby’s life, is a brave young man who could brake the shell of a very hard nut in his teeth and give the nut to Pirlipat. A brave young man succeeds, he saves the life of the princess but just before Lady Mouseykins dies during a battle, she turns the man who saved the princess' life, into a nutcracker. The tale ends when Marie Stahlbaum tosses her slipper at the mouse, and when the mouse dies the wooden nutcracker is restored to his human form again. In GABAY’s story, Shortly after Drosselmeyer arrives at the Stahlbaum’s Christmas party, he stages a play for the guests. The play tells the story of a princess and a mouse craving for cheese and the King and the Queen saying “no” to their pleas. Because this mouse has magic powers, he puts the princess to sleep. The princess will not wake up until a rare nut is found. When Dross, (not Drosselmeyer) who is a star gazer, brings the hard nut to the palace, the King decrees that any suitor who could crack the “hard nut” with his teeth could marry the princess. Many suitors tried, including Nimble and Nye, but it was not until Dross brings Klaus, his nephew, that the problem is solved. Klaus cracks the hard nut with his teeth and on that moment the princess awakes. Apparently upset, the mouse bits Klaus and turns him into a nutcracker. The tale ends when during the battle the mouse dies and the wooden nutcracker is restored to his human form again. In GABAY’s ballet, Drosselmeyer, danced by RODRIGUEZ who is B.S.J. Principal Ballet Master, dresses elegantly in a velvet purple suit, dances well and has the bearing of a gentleman, but because there is nothing to distinguish him in his attire, he just “looks” like any other guest at the party. In this version Drosselmeyer is a star gazer, how does the audience learn what he is? he bears no stars in his outfit, and he brings no stars as gifts. The main problem with his character as presented in this ballet, is that Drosselmeyer does not show us that he can create "magical" toys. Becase of it, there is no way the audience can believe that Marie is convienced, when looking at his toy nutcracker, that he is the prince of Drosselmeyer's story. Because as an art, the Ballet lacks dialogue, and on opening night RODRIGUEZ failed (in his pantomime) to make audience aware that he was “telling a story.” to the guests at the party, (A change of lighting could have helped), many people in the audience wondered why were a King, (ANTON PANKEVITCH) a Queen (CYNTHIS SHEPPARD) a Princess (MIRAID NODA) and two ball-bouncing men (AKIRA TAKAHASHI and PETER HERSHEY) doing at the Stahlbaum’s. For those who understood that the royals were part of Drosselmeyer’s “story,” the story did not impress us as a dance. The King Mouse biting Klaus on the stage, looked ludicrous and not even the dance mastery of RAMÓN MORENO (who played the role of Klaus and Nutcracker/prince) or his fantastic pantomime could convince the audience that the mouse bite had now converted him into a wooden nutcracker. His transformation was deficient, (some special effects were needed) Another matter that confused the audience in the story was that they were led to believe that the KING MOUSE magic can put a person to sleep (as it happened with the princess) not convert a man into a nutcracker. While GABAY’s choreography was creative, in some dances she needed to focus the attention of the audience on the principal dancers. In ACT I, for instance, Drosselmeyer (RODRIGUEZ) a principal character in the ballet, stands up back stage, as the adult couples dance on Stage Front in front of him. In another dance, the children dance in front of him as he stands holding a box Back Stage next to the Christmas tree. As Marie (MARIA JACOBS-YU) Another Principal dancer of B.S.J. and the lead in this NUTCRACKER, dances a rhythmic ballet solo in Pointe holding the toy Nutcracker in her arms, the adult couples dance next to her. At that point, the stage gets so “crowded” with all these dancers that the audience doesn’t know what to see. The result is that JACOBS-YU classical solo dance completely loses focus. The problem is repeated again when later in the same Act, Marie (JACOBS-YU) places her “hurt” nutcracker on her dolls’ bed while sitting on the floor on the Right corner of the stage as the couples dance on Stage Front center. Because Marie is sitting and the couples are dancing, Marie's actions get out of focus again. Because of the mastery of all Ballet San José dancers, all the dances on that night were masterful on technique. 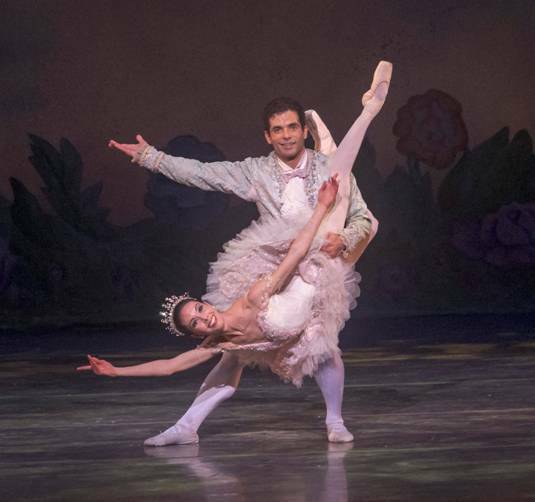 Outstanding, however, among them was the Grand pas de deux of the Nutcracker/prince RAMÓN MORENO and MARIA JACOBS-YU as Marie. Aside from looking “regal”in all their movements, the couple managed to form beautiful body figures with each “Fish.” Their solo dance was also outstanding, with JACOBS-YU spinning rapidly in Pointe around the stage and RAMON jumping with both legs wide open in the air parallel to the floor. The Spanish dance with SHANNON BYNUM, RUDY CANDIA, JING ZHANG & DAMIR EMRIC was rhythmic. MAXIMO CALIFANO showed his dancing masterly and also his strength in his Arabian dance lifting both BETH ANN NAMEY and NUTAREE PIPIT SUKSUN in his arms. He also made us laugh in his second role as The Sugarplum Fairy hiding six small children under his crinoline. While the men in the Russian dance needed synchronization, AMY MARIE BRIONES was excellent in her part. The Chinese Dance with AKIRA TAKAHASHI, JUNNA IGE y MIRAI NODA was dainty. Under the direction of conductor GEORGE DAUGHERTY, the Symphony Silicon Valley orchestra sounded thin, but in tune. There are also some details that may need to be changed in the future. Life-size mice running on the living room during the party don’t look good and Mrs. Stahlbaum trying to hit them with a broom looks even worse and completely out of place in this ballet. Another things that may require changing is the staging. Since the tour to all these “magic Lands” was given to Marie by her nutcracker as a reward for helping him regain his human form again and he is showing her all these places, both Marie and the prince ought to be present in each place. The audience also would have liked to see what mean of transportation used the nutcracker/prince to take Marie on this trip. The scenery in the ballet is creative and some of the effects are beautiful, such as the big dresser of Marie’s dolls where she places her nutcracker on that night.. The most wonderful effect in this production, however, is the lighted ornamented Christmas tree that grows bigger and bigger. 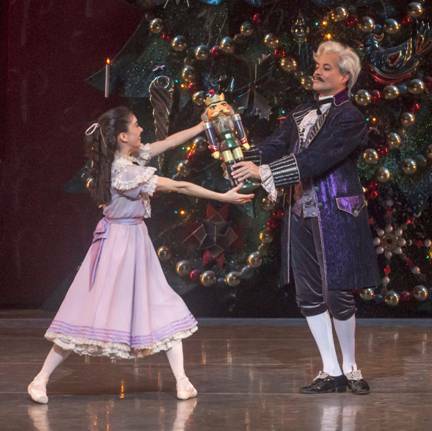 Since this was the premiere of a new ballet, we hope that all its little flaws will be corrected next year so THE NUTCRACKER of Ballet San José becomes again the best NUTCRACKER of all the NUTCRACKER ballets. THE NUTCRACKER will play through December 23, for tickets call (1-408) 288-2800 or order them online at www.balletsj.org.